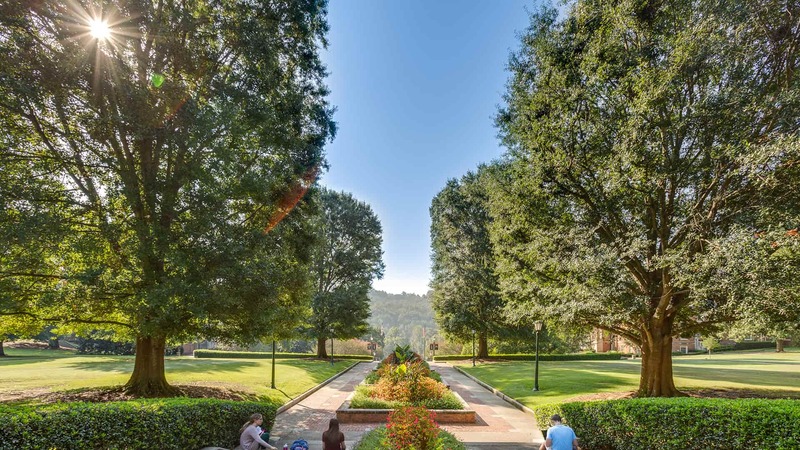 Samford University's required core curriculum of 22 credits provides the foundation for a student's liberal arts education and professional training in the major. In addition to the Core Curriculum every Samford student takes courses distributed over a number of disciplinary areas. These courses sustain the intellectual growth begun in the Core by introducing diverse approaches to exploring our shared humanity, our relationships with each other and the creation that is our home. They invite students to learn new ways to understand their places in a complex world while encouraging them to apply the results of their academic inquiries to larger questions of meaning and value. Each course selected for inclusion in these distribution areas is not simply a foundation for further study but an initiation into a way of thinking intrinsic to a discipline. The standard General Education Distribution Curriculum requires eight credits in the Natural and Computational Sciences, three credits in Fine Arts, and four credits each in Mathematics, Humanities, and Social Sciences. It also requires study of a Second Language and Culture through the intermediate level. Some schools, departments, degrees, and majors may require variations to this standard. The general education requirements for each program may be found in the Samford University Catalog. These courses develop students’ quantitative literacy. This includes equipping them with a confidence and ease with the applications of quantitative methods; an understanding of the nature and history of mathematics and its importance for comprehending issues in the public domain; the ability to interpret data and mathematical results within a real-world context; the desire and ability to use logical reasoning techniques to analyze arguments, detect fallacies, and evaluate risks; the habit of using mathematics in making decisions and solving problems in everyday life; the accurate intuition about the meaning of numbers in measuring things; and an adeptness with algebraic symbols and their proper syntax. These courses enhance the Core Curriculum by providing a dimension of depth to the breadth of material covered in both Communication Arts and Cultural Perspectives. Just as students in UCCA increase their proficiency in their first language by honing their oral and written communication skills, so students in world, ancient, and biblical language courses develop complementary skills of listening, speaking, reading, and writing in their chosen second language. In similar fashion, these students draw on the broad knowledge gained in their Cultural Perspectives Core classes as they study in depth the civilization and culture of one of the world’s major linguistic zones. Students are encouraged to do at least a portion of their language study at one of our affiliate centers abroad, where they can live both the language and the culture on a daily basis. These courses build upon the foundation of Cultural Perspectives by increasing students’ awareness of cultural, historical, literary, philosophical, and religious influences upon the development of civilization. In these courses students will become more acquainted with works concerned with human culture and experience, particularly humanity’s quest for meaning and value. These courses cultivate the arts of reading, writing, speaking, and critical thinking and engage texts and their contexts with critical comprehension.